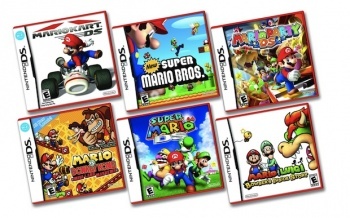 Want to pick up a Mario game for your now-cheap DS Lite? Just look for the red boxes. Nintendo is all about the future these days. It has a shiny new 3D-capable handheld and it has a brand-new console set to debut next week at E3 - why wouldn't it be looking ahead to the future? But Nintendo still has two consoles on the market, and the venerable old DS is one of the most successful platforms in gaming history. If you're one of the four people on the planet who haven't yet bought a DS, it'll soon be cheaper: Nintendo has announced that as of June 5th, the DS Lite will be retailing at a MSRP of $99. That's $150 cheaper than the 3DS, and it also has way more games than its newer, bigger brother. To help you find some of those games, Nintendo has announced that it will be re-branding six of its Mario games with newer, more eye-catching red boxes. Considering how the games in question - New Super Mario Bros., Mario Kart DS, Super Mario 64 DS, Mario Party DS, Mario & Luigi: Bowser's Inside Story, and Mario vs. Donkey Kong: Mini-Land Mayhem! - are all pretty darn good, making them stand out on the store shelves is probably a good idea.